This weeks theme of Texture Tuesday with Kim Klassen is Love. Delicious little shortbread biscuits. 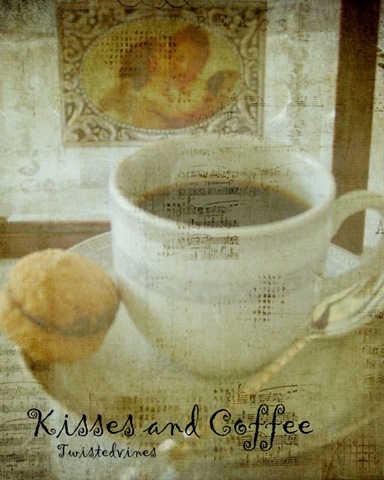 Baci di Dama – the translation…Ladies Kisses.The original recipe is from Piemont – northern Italy. Known for it’s hazelnuts. Two round hazelnut – almond shortbread biscuits joining by a kiss of chocolate in the centre. Wonderful choice for this week’s theme. Love the angels in the background. Texture worked well on this. Oh my, I really really like this. Hope your day has been blessed!! Gorgeous Shot, i love this! It looks so good in more ways than one. I love the photo…looks highly appealing and inviting to sip and nibble. Artistically very well done – composition, colors, texture – a complete picture of delight for the senses. Your photos lately have taken on an air which, in my opinion, are both homely (cozy and comfortable) and commercially attractive. Thanks Kia, once you try these, one is never enough! With their crunchy hazelnut biscuit and creamy chocolate filling…and with their teeny bite size…they are a pure sweet indulgence. x.